Only moments ago, radical anti-gun Democrats in the DFL-controlled House introduced 2 MAJOR pieces of gun control legislation. Please read this email in its entirety and then take action to defend our Second Amendment freedoms! 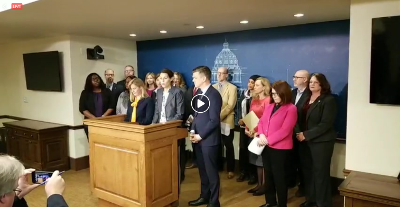 The bills are Michael Bloomberg’s signature gun control bills, “Red Flag Gun Seizures” and “Universal Background Checks” aka Statewide Gun Registry and they’re being introduced by anti-gun militant Representatives Dave Pinto (DFL-St Paul) and Representative Ruth Richardson (DFL-Inver Grove Heights). “Red Flags” gun seizures (which doesn’t have a bill number yet) would be a total destruction of our 2nd, 4th and 6th Amendment rights, making you “guilty until proven innocent” and allowing the confiscation of your firearms just because someone made a claim that you were dangerous. No proof, no arrest, no indictment, no conviction. Nothing. “Universal Background Checks”, which doesn’t yet have a bill number, is nothing more than code for a statewide gun registry and would require that every firearms transfer go through a Federal background checks. That includes giving a firearm to your spouse for protection, a 22. rifle to your grandson for his birthday, or even loaning a shotgun to a friend for a weekend hunting trip. If you didn’t comply, you’d become a FELON! Speaker Melissa Hortman has sworn that she intends to streamline this process and pass this garbage legislation through her House chamber as quickly as possible — so we need to act fast! First, tell your lawmakers to stop, block, and OPPOSE any attempt to pass Representative Ruth Richardson’s ‘Red Flag Gun Seizure’ legislation in the House! Second, tell your lawmakers that you want them to vote NO on any and all attempts at passing Representative Dave Pinto’s Statewide Gun Registry in MN! After you’re done, please share those links with your family and friends who care about the Second Amendment, and urge them to send in their emails, too. Second, please make an immediate contribution to help us pour an avalanche of pressure on top of these anti-gunners and stop this gun control push! Now that we know who the authors are, we’re moving forward with our huge defensive programs to pressure weak anti-gun lawmakers to oppose this legislation. Mass email, targeted direct mail, radio ads, door-to-door lit drops and even TV Ads will be in the works if we can afford the air time. And I need YOUR help to fund it! A contribution of $500, $250, $100, or even $25 would go a LONG ways to helping fund this defensive fight. Whatever you can do, now is the time to do it. We’ll bring you more updates from the capitol in the near future and keep you up to date on this fight. P.S. Radical gun control has been introduced in the Minnesota House! Please read the email above and take immediate action in defense of our gun rights. Speaker Hortman is promising to streamline this gun control push so we’ve no time to waste! JOIN MGR BY CLICKING HERE!